Last week, I shared with you in my blog two upcoming opportunities. On January 21, CHA is hosting an informational open house at the DeMoss’ home from 6:30 PM - 7:30 PM. There will be another open house at the DeMoss’ home on February 25 along with others throughout the spring semester. We would love to invite anyone interested in attending CHA next year to attend. 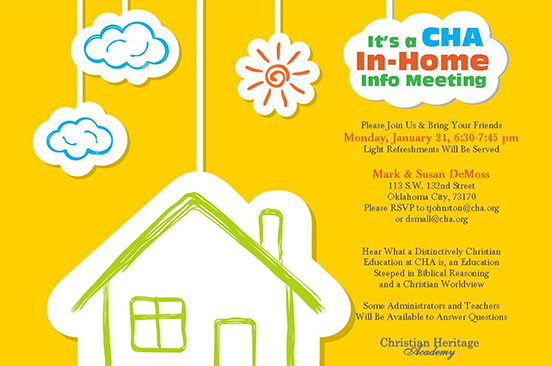 If you know of someone who would like to attend this informal home gathering to learn more about CHA, please contact Mrs. Small at dsmall@cha.org. In addition to the upcoming open houses, on January 23, CHA is hosting a Pastor’s Appreciation Breakfast in CHA’s cafeteria from 7:30 AM - 8:30 AM. The event is free. Students are encouraged to invite their church's pastor to the event. We understand that there are several students who may share the same pastor. The first family to register their pastor will be allowed to attend the breakfast with their church pastor. All siblings in the first family to register may attend the event with their pastor. Mrs. Dawn Pruitt will notify any families for whom a pastor has been previously registered. If you have any questions, please contact Mrs. Dawn Pruitt at 672-1787, ext 204 or dpruitt@cha.org. The deadline to register your pastor is Friday, January 18. Please use this link to register your pastor. I pray that you will consider each of these upcoming invitations at CHA.